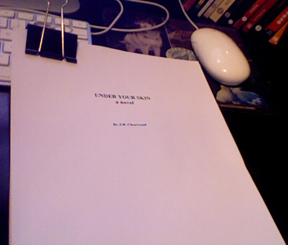 NOTE: The following is the first chapter from my first full novel coming out this fall entitled, “Under Your Skin”, being released under my fiction pen name J.R. Chartrand. It is the first in a series that follows young reporter Cal Howell, who finds it curious that no one in the small town of Statenville really cares why three high school football stars wind up dead in a 24-hour period. Cal’s journey to uncover the truth with staff photographer Kelly Mendoza puts them in the middle of two intersecting cover ups and sends them running for their lives — story or no story. Here’s the opening chapter — I hope you enjoy it. And if you like this, please head on over to Facebook and like my author page for J.R. Chartrand for further updates and the action-packed trailer that will be out next month. Cody Murray shifted in his recliner as he flipped the pages of his favorite sports magazine. Sitting still wasn’t in his repertoire of skills on the field or off it. He lived like he played – always in constant motion. But it was Sunday afternoon and Cody was trying to relax. He only had two vices, one of which was wasting time reading national sports magazines. The other he had enjoyed about 15 minutes earlier. He knew it was wrong, but for an athlete who never stopped, it was the perfect enhancement to his workout regimen. Cody knew steroids were bad and tough to get, especially in a rural town in southern Idaho. So, he didn’t bother trying. He wanted his impressive body of work to be his body of work – he just needed a little help, a little kick while working out. It was harmless … at first. Cody dug his jagged fingernails into his left arm in an attempt to remedy a slight itch just above his elbow. It was an irritating distraction from reading the magazine he dreamed of being on the cover. As unlikely as it might be for the 6-foot-flat scrambling quarterback of a rural Idaho eight-man team to earn a handful of major football scholarship offers, Murray had done it. Why not the cover? he mused. But the thoughts abandoned him when the itching started. At first, it felt like any other itch. Cody expected it to vanish with one quick scratch. But it didn’t; the itch got worse. What is wrong with me? he thought, as he surveyed his arms. Red whelps were forming on his arms and spreading to his chest and back. All the scratching seemed to make it worst. In less than a minute his muscular athletic body was covered. All he could think was of getting relief the fiery pain. He jumped up from the couch and staggered toward the back door, leaping from the back deck then sprinting toward the Aspen pine twenty yards away. Rational thought had deserted him. He slammed his back against the tree and began rubbing against it, thrusting upward from a crouching position in an attempt to stop the itching. It got worse. Frantic for relief, Cody ripped off his Statenville workout shirt and raced back into the house, heading straight for his parents’ bathroom. In his mad rush to find anything to help him, Cody grabbed a tube of anti-itch cream. He emptied its white contents into his right hand and slathered it all over his bare chest. Still no relief. The itching intensified. Cody ran back outside to the pine tree. Maybe with my shirt is off, I’ll be able to stop the itching. Passed despair, he dug both hands into opposing forearms, fell to the grass and rolled and scratched, crying out in agony. The intense itching turned to fire. Cody screamed and flailed about on the ground in sheer torture. Nothing was working but he couldn’t stop trying. His body was covered in bleeding whelps as he writhed in the grass. One final spasmodic convulsion and the itching stopped. So did his breathing. Streaks of blood created eerie patterns across his chest. He looked as if a pack of backcountry wolves mauled him or his body was the discarded carcass of a sadistic cult ritual. No one would believe that Cody Murray, Statenville’s greatest football star in 50 years had scratched himself to death.